What is Behavioral and Cognitive Therapy? Japan Association for Behavioral & Cognitive Therapies specializes in a type of psychotherapy called Cognitive Behavior Therapy (CBT). CBT is a group of treatments based on scientific, empirical data shown to be effective for a broad range of psychological disorders. Because each individual is different, each treatment is individualized to the specific patient problem. In each case we make use of various CBT treatments shown in controlled clinical trials to provide long-lasting results. CBT is generally a time-limited psychotherapy, meaning that an individual has appointments over the course of 3-6 months, with follow-up sessions as needed. Treatment is goal-oriented, where the therapist and the client work together to develop goals and working step-by-step towards achieving those goals. Clients actively participate in treatment both within and between sessions, e.g. clients are given task assignments to complete between sessions. Behavior Therapy is a type of approach to psychotherapy that focuses on isolating the specific behavior the client wants to change by trying to understand how the problematic behavior developed in the first place. Once the client learns how the unwanted behavior developed, they can then develop specific skills and techniques to control or even eliminate undesired behaviors. While many of the specific techniques used to bring about these changes were developed originally by behavior therapists (e.g. deep muscle relaxation and assertiveness training), we also make use of strategies adapted from hypnotherapy, systems therapy, and traditional psychotherapy. "Exposure" based treatments have also taken an important place in the treatment of a number of anxiety disorders. In recent years, CBT therapists have also made use of mindfulness and acceptance based approaches that borrow from eastern psychologies regarding "thoughts" and meditation practices. These new approaches involve teaching clients a completely different relationship to thinking in general. By developing mindfulness techniques, clients are taught that "thinking" is just one of many ways of "knowing". Clients then learn to notice and interrupt negative thoughts on their own and live more fully "in the moment"
Cognitive Therapy refers to an approach pioneered by a group of therapists in the 1970s, including psychologist Donald Meichenbaum (Cognitive Behavior Modification), Albert Ellis (Rational Emotive Behavior Therapy) and psychiatrist Aaron Beck (Cognitive Therapy). In cognitive therapy, clients learn how to recognize automatic negative thoughts and realize how they effect emotions. Clients learn how to analyze these thoughts in terms of helpfulness and learn to replace them with more productive thoughts. Dr. Beck discovered that many of his clients' problems were supported by recurring thoughts, usually of a self-critical or pessimistic nature (e.g., "I'm no good." or "I can't handle things"). Because thoughts can influence feelings and behaviors, Dr. Beck realized that isolating negative thoughts and replacing them with more positive thoughts is useful in the client's understanding of his/her disorder. Cognitive therapists not only make clients aware of these thought patterns, but get them to explore new ways of thinking about themselves, their lives, and their actions and see what positive effects this may have. What conditions can be helped by cognitive behavioral therapy? CBT has been shown to help people with various conditions - both mental health conditions and physical conditions. 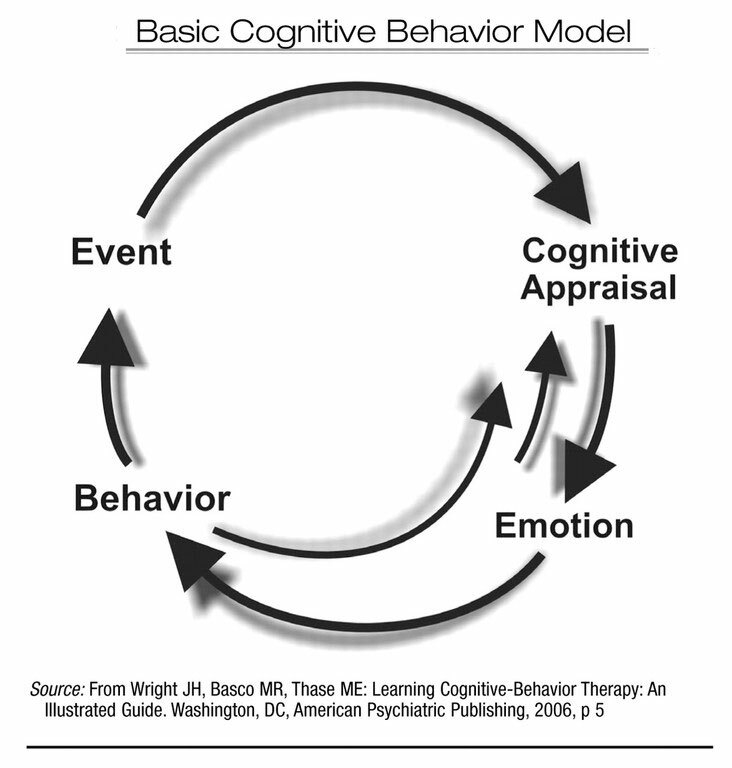 What is likely to happen during a course of cognitive behavioral therapy? The first session of therapy will usually include time for the therapist and you to develop a shared understanding of the problem. This is usually to identify how your thoughts, ideas, feelings, attitudes, and behaviors affect your day-to-day life. You should then agree a treatment plan and goals to achieve, and the number of sessions likely to be needed. Each session lasts about 50-60 minutes. Typically, a session of therapy is done once a week. Most courses of CBT last for several weeks. It is common to have 10-15 sessions, but a course of CBT can be longer or shorter, depending on the nature and severity of the condition. In some situations CBT sessions can be done by telephone. You have to take an active part, and are given homework between sessions. For example, if you have social phobia, early in the course of therapy you may be asked to keep a diary of your thoughts which occur when you become anxious before a social event. Later on you may be given homework of trying out ways of coping which you have learned during therapy. How well does cognitive behavioral therapy work? CBT has been shown in clinical trials to help ease symptoms of various health problems. For example, research studies have shown that a course of CBT is just as likely to be effective as medication in treating depression and certain anxiety disorders. There may be long-term benefits of CBT, as the techniques to combat these problems can be used for the rest of your life to help to keep symptoms away. So, for example, depression or anxiety are less likely to recur in the future. There is good research evidence too to show that CBT can help to improve symptoms of some physical conditions such as rheumatoid arthritis. What is the difference between cognitive behavioral therapy and other talking treatments? What are the limitations of cognitive behavioral therapy? CBT does not suit everyone and it is not helpful for all conditions. You need to be committed and persistent in tackling and improving your health problem with the help of the therapist. It can be hard work. The homework may be difficult and challenging. You may be taken 'out of your comfort zone' when tackling situations which cause anxiety or distress. However, many people have greatly benefited from a course of CBT. CBT tends to deal with the here and now - how your current thoughts and behaviors are affecting you now. It recognizes that events in your past have shaped the way that you currently think and behave. In particular, thought patterns and behaviors learned in childhood, However, CBT does not dwell on the past, but aims to find solutions to how to change your current thoughts and behaviors so that you can function better now and in the future. How can I get cognitive behavioral therapy? Your doctor may refer you to a therapist who has been trained in CBT. This may be a psychologist, psychiatrist, psychiatric nurse, or other healthcare professional. There is a limited number of CBT therapists available on the JABCT. You may wish to go privately if it is not available in your area on the JABCT. Although CBT with the help of a trained therapist is best, some people prefer to tackle their problems themselves. There are a range of books and leaflets on self-help for the problems which CBT is useful for (anxiety, phobias, depression, etc). More recently, interactive CDs and websites are being developed and evaluated for self-directed CBT for a variety of conditions. JABCT will provide computer based therapies.